A pretty, well-maintained coastal track from Paihia to the car ferry at Opua, offering beautiful views of the bay, sea birds and a passing vista of sea craft. In summer you may like to take a picnic lunch and enjoy a swim on the way. You can organise return transport by taxi or tuk tuk. Begin at the visitor centre on the waterfront in Paihia. Face the sea and turn right past the maritime centre. Just past the public toilets on your left you will come to Flagstaff Hill, a good viewpoint over the town and the bay. Turn left when you return to the bottom of the hill and you will pass an old boat house at the northern end of the beach where Tom Joyce built and repaired whaling boats in the 1880s. It is still in use for marine-related activities today. Stroll along the sandy beach and follow the coastline at the end. If the tide is too high the next section of the walk can be taken by following the road up and over the hill. At the southern end of Paihia beach you will pass the site of the first wharf built in the bay, designed to load cattle onto scows in the early days of European settlement. Soon after it was built, the wharf was destroyed in a storm and lumps of concrete used in its construction can still be seen tumbled in the bay. The concrete cattle race remains. Follow the shoreline to Sullivans Beach, formerly known as Stockyard Bay (see history pages) where cattle were driven to be held prior to being shipped to Auckland markets in the days before there was road access to Paihia. They were swum out and hoisted by sling onto the deck of the coastal scows. This is a safe, sandy, all-tide swimming beach and a good fishing spot. The island guarding the bay is Motuarahi Island which provides a sheltered anchorage for small boats. After another rocky stretch you will come to Te Haumi, a shallow tidal bay where you will often see wading birds such as oystercatchers, seagulls and heron feeding at the water’s edge. At low tide the southern end of the beach is a favourite gathering place for a local shellfish, the pipi. You may find them just a few metres off shore in the shallow water by digging a few centimetres into the sand. Cross the Te Haumi River by the road bridge. Here the track leaves the road on the left and follows the coastline along an elevated track past several small beaches and secluded holiday homes. Shortly you will reach Smiths Holiday Camp, a sheltered family camp at the water’s edge. A small shop provides supplies to campers and makes a welcome drink or ice cream stop for walkers. 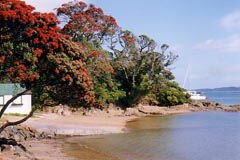 In late winter the flame trees which line the beachfront provide a stunning display of scarlet flowers which attract dozens of glossy native tui who feed on their nectar and perform acrobatics in the branches. Their distinctive calls echo round the bay. The walk continues across a boardwalk through the mangrove trees. If you stop for a time at low tide you will see small crabs emerge from their holes in the mud to feed. At the slightest sound or movement, they instantly scuttle for cover. Listen for the sharp sounds of the snapping shrimp or, if the tide is high, watch for mullet feeding amongst the mangroves. This environment plays an important part in the food chain of the sea with many juvenile forms of sea creature growing to maturity here. The track continues around the coast, often shaded by trees. Sit a while on one of the seats provided at vantage points en route and enjoy the ever-changing scenes of Veronica Channel, busy with craft of all descriptions – yachts, fishing boats, launches and multi-coloured kayaks. If you are lucky you may see gannets diving or even passing dolphins. There is access to many small beaches for picnicking, swimming or rock fishing. In late summer wild fig trees provide a sweet snack along the way. The final section of the track passes a busy boat yard then follows the shoreline past the Opua Hall and beachfront homes. The large two-storeyed building on your right, now an apartment building was the original Opua store, then later a boarding house. The walk ends at the ferry ramp but you may like to stroll along the Opua Wharf, built when Opua was a busy port loading coal from the Kawakawa coal mines. The wharf is now used mainly by fishing boats and yacht charter companies and is a popular fishing spot. The Opua Store, built over the water, provides refreshments and there is a telephone outside where you can ring for a taxi or tuk tuk to take you back to Paihia.